Pick up the rudiments of botanical art at this dreamy studio in the Kalimpong hills run by an international award-winning artist. And you can also pick up gorgeous artworks done by children of tea garden workers. 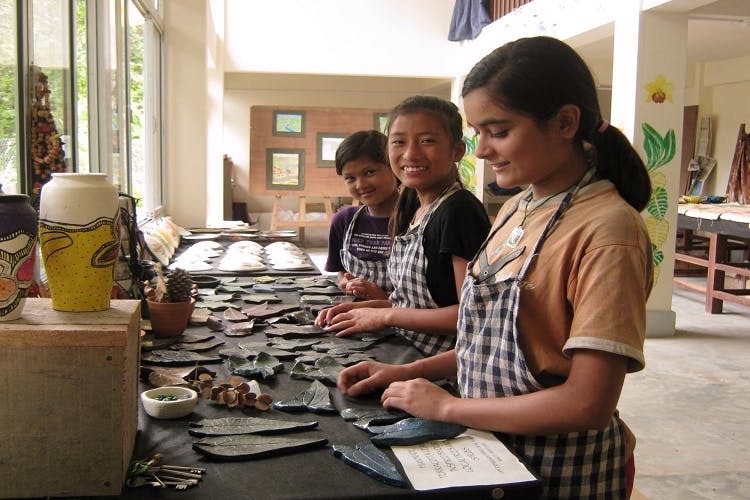 An art studio set in the picturesque Kalimpong hills, The School for Natural History Art is run by Hemlata Pradhan, an award-winning botanical illustrator. Hemlata has studied at the Royal Botanic Gardens in Kew, the Royal College of Art in London, and is the winner of UK’s Royal Horticultural Society’s Gold Medal. The studio is perched on a hill and has jaw-dropping views. Take a break and also pick up the rudiments of botanical art at an art studio in the hills. Anyone can join their informal weekend classes. You can attend workshops and classes in natural history art and various other art forms. Or if you have any expertise to share with the children, or can hold interesting workshops with them, the studio welcomes you to stay and teach. You can also pick up some art made by Hemlata and by her students - the children of tea garden workers. You can pick up botanical paintings and ceramic art at the studio, as well as sets of gorgeous greeting cards and bookmarks with images of Hemlata’s botanical drawings. Interested? Contact Hemlata at hemlata.pradhan@gmail.com. And her address is Chilauney Botay, Relli Valley, Pudug Khasmahal, Kalimpong- 734301.